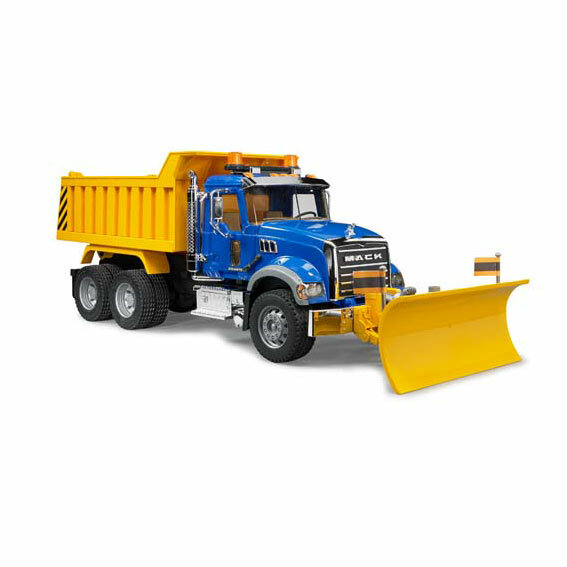 This 1:16 scale Mack Granite Dump Truck with Plow is an exact replica of the original. Features including a realistic driver's cabin (with doors that can be opened), a tilting engine hood, foldable rear-view mirrors, dump bed, treaded tires, and chrome tanks and exhaust make this truck a true feast for the eyes of every truck fan. Other fun features include an adjustable angle Plow, and a push button Lights & Sounds module (two AA batteries included) with four different functions - police yelp, engine noise, police siren and fire department siren.